This is a very easy, very good dark chocolate cake, wonderful with a variety of frostings, or just dusted with confectioners' sugar. If you like you may bake the batter in 8 inch pans instead to give the cake extra height; the layers may take an extra few minutes to bake. Preheat oven to 350 degrees. Grease and flour two 9 inch round cake pans and set aside. Pour wet ingredients into dry and whisk until thoroughly combined. Divide evenly into prepared pans and bake for 25 to 30 minutes, until cake tester inserted in center comes out clean. Cool 10 minutes, then remove from pans onto wire racks and cool completely. Frost with Vanilla Buttercream, below, or your favorite frosting. Split each layer in half horizontally, to create four layers. Place one layer on a cake plate and spread with 1/4 cup raspberry jam, then cover the jam evenly with a thin coating of buttercream. Repeat with two more layers, then place the final cake layer on top. Frost the top and sides with a very thin layer of buttercream. (There will be buttercream left over. It's fine if the cake shows through; this is just the undercoating of the forsting meant to trap any crumbs and prevent them from showing through the finished cake. )Place the cake in the refrigerator until the buttercream is firm to the touch, about an hour. Reserve about 1/2 cup buttercream to use for attaching the cookies to the cake. Re whip or stir the remaining buttercream and use it to finish frosting the cake. Pipe a border around the bottom edge of the cake. If you like, sprinkle sparkling sugar on the top of the cake. Pipe a border or rosettes around the top edge of the cake. 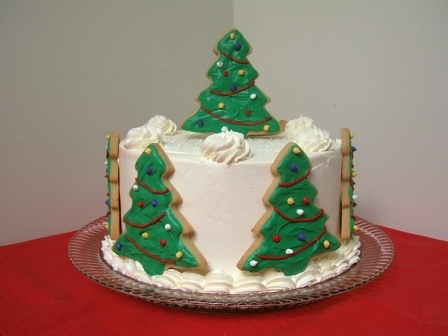 Before serving, gently press the frosted cookies to the sides of the cake, using a dab of the reserved buttercream to help adhere the cookies to the cake. For the top of the cake, insert a drinking straw into the cake, making sure the length of straw that sticks up is slightly shorter than the height of the cookies. Place a generous dab of buttercream on the backs of two cookies, then press together, sandwiching the straw in the middle.